My VMware - License Key Search Feature. Projects: License Key Search Feature. I joined VMware in late 2012 as a User experience designer. I was tasked to design a solution for searching license keys for all VMware products on My VMware platform. 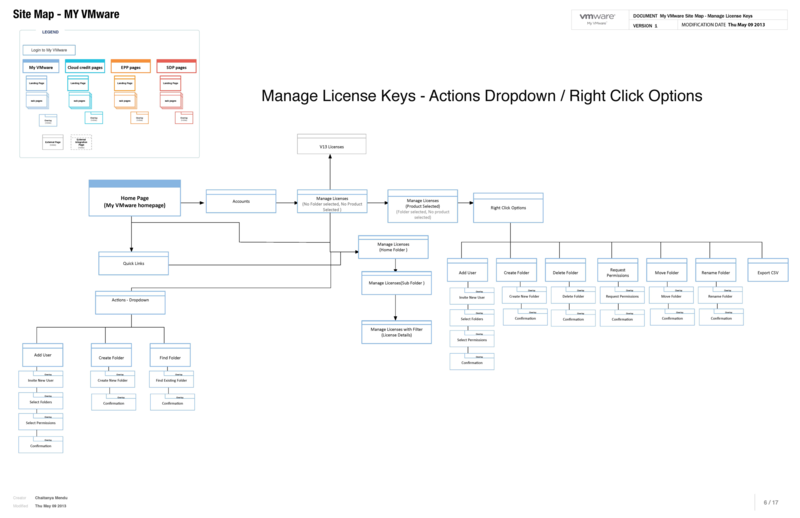 The License Keys page allows users to manage and organize license keys in an intuitive and flexible manner through a folder management system. 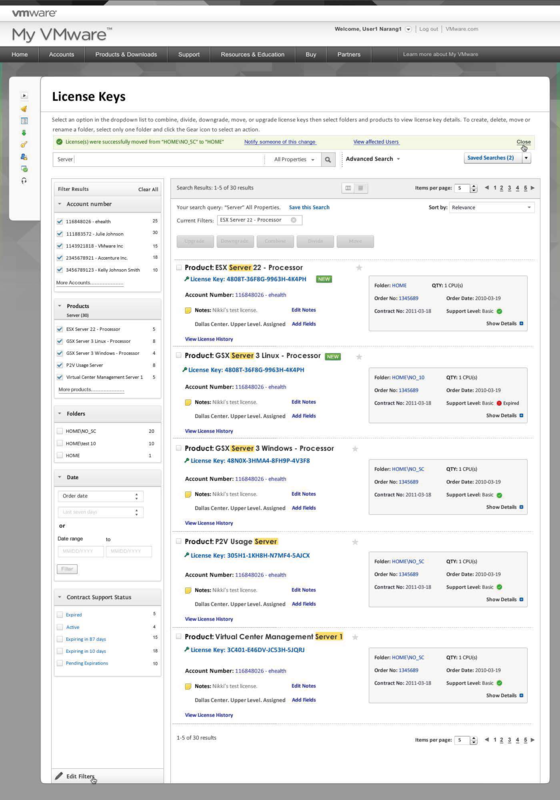 My VMware portal is an integrated, self-service, account-based platform focused on simplifying and streamlining product license and support management activities for VMware customers and partners. Users search their license keys using keyword search and filters such as products, notes, license Keys, users, status, folders, etc. Advanced search - Users further filter their search results based on Product Status, Users Order Date, Contract Begin Date, Contract End Date, Folder, Notes and Custom fields (searchable). Search results view options include Detail view, Single pane view, Tabular view, Sorting, Customize viewable columns (table view only), Custom fields, License Keys status, Active/Inactive (assigned/unassigned), New (i.e created in past 5 days), Expired service contract, New product version available. License Key actions: Contextual operations (move, upgrade, downgrade, divide), Bulk operations (move, combine, upgrade, downgrade), Dynamically changing action menu. 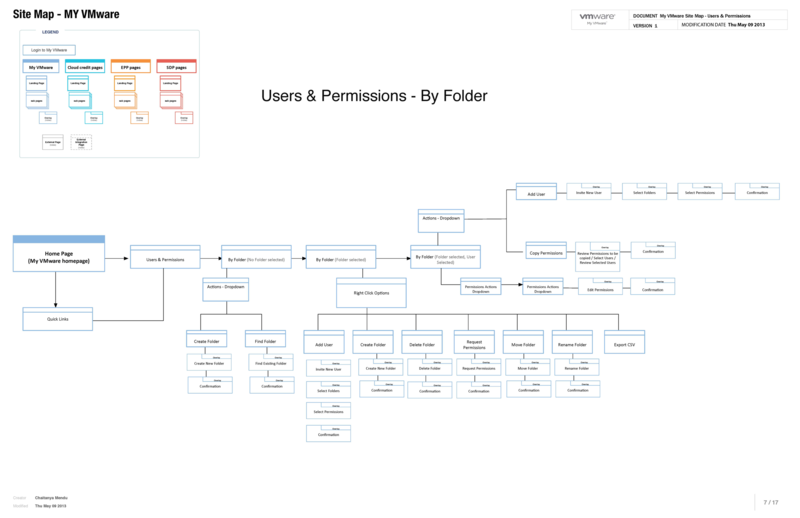 License Key detail page: My permissions, User’s with access to key, Export data into different formats such as .csv, .xsl, etc. 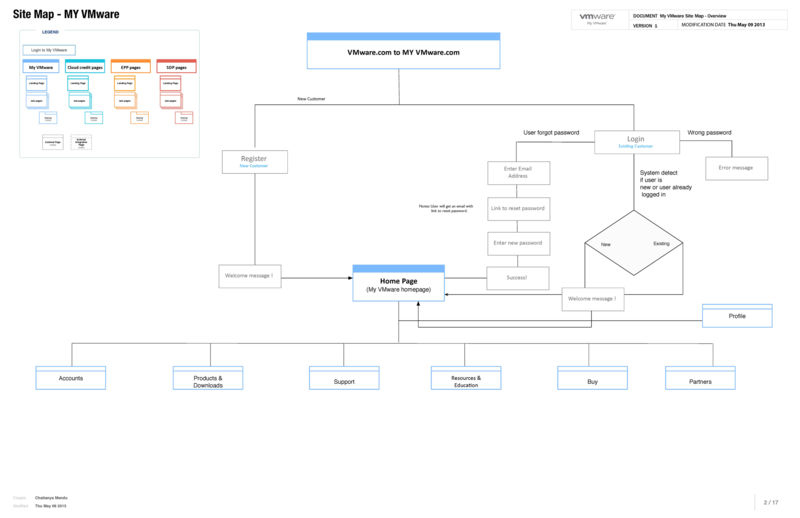 Creating wireframes helped me to analyze and validate application requirements. Worked very closely with MY VMware licensing platform CX strategists, UI engineers to strategize the solution. I combined insights that were captured during research and usability testing to iterate the designs.